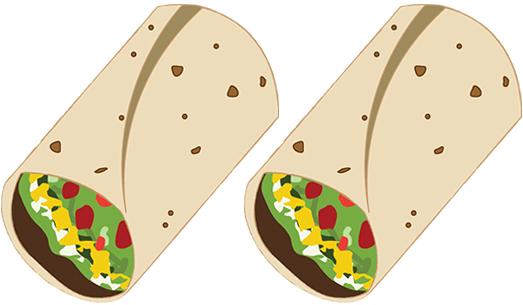 Home Uncategorized Battle of the Burritos: Which fast-casual chain reigns supreme? On the surface, each of these burrito joints is virtually indistinguishable. Sure, some give you free chips, others offer barbecue sauces, queso, or green chiles, but at the end of the day, each offers you a tortilla filled with rice, beans, meat, salsa, cheese, sour cream, and/or guacamole. Which begs the question: Which of these fast-casual chains is the best? In order to crown the boss burrito, I used my body as a punching bag and ate at Moe’s Southwest Grill, Willy’s Mexicana Grill, and Bell Street Burritos (all based in Atlanta); Athens-based Barberitos; and national behemoths Chipotle Mexican Grill and Qdoba Mexican Eats—all in the span of about a week. Using the taste, value, quality of tortilla wrapping (seriously, it matters), guacamole, and an x-factor unique to each chain, I determined which chain makes the best quick burrito. What I ordered: White rice, black beans, pork, fajita peppers and onions, queso, pico de gallo, corn salsa, sour cream, cheese, guacamole, and lettuce. The combo included chips, salsa, queso, and a drink. Moe’s is a solid choice for your quick burrito fix, but it always leaves something to be desired. While everything was fresh and nothing over or undercooked, the entire burrito was just lacking that extra kick that I’ve tasted at some of the other restaurants. They get high marks for their queso, however—I can’t recommend it enough. For $10.75, I was able to get a filling meal, including chips, a drink, and my choice of a side of queso or guacamole. Though the queso/guac is small—less than a quarter cup—it’s more than enough for your side of chips. And if you do have chips left over, bathing them in one of the many offerings from the salsa bar should finish the job. The Moe’s assembly line is a bit longer than others, and I’m convinced they use that space to hide whatever magic they use to squeeze all the toppings into a single burrito. I hardly lost a thing when I ate it, which is a rare treat. If you’re the kind of person who normally orders guac, you’ll be satisfied, but there’s nothing to write home about here. Some places have their own signature sauce, but a signature soda? 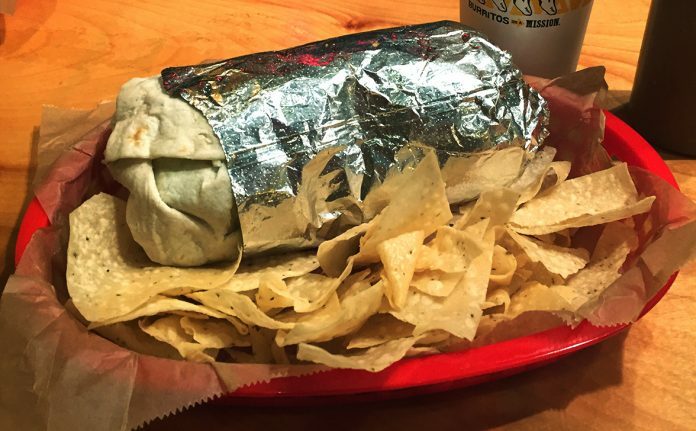 Moe’s is the only ATL burrito spot claiming that honor. The Vanilla at Peachtree Soda, available from a Coke Freestyle machine, combines fizzy flavors of vanilla and peach into a drink that will remind you of one of those Sprite-based punch concoctions from your childhood. What I ordered: White rice, pinto beans, pork, cilantro, salsa fresca, grilled onions, green chilies, guacamole, queso, and sour cream. I chose a regular size burrito and had it grilled. The combo included chips, salsa, and a drink. So fresh! By far, Bell Street brought the freshest ingredients to this battle. Even the green chilies, which are easy to phone-in this many miles away from New Mexico, were solid. Bell Street nickels and dimes you on fixins and extras. An upcharge for guacamole or queso is fairly standard, but 75 cents for sour cream? 25 cents for grilled onions? Those two popular choices added an extra dollar to an already expensive fast-food trip. My order, including chips and a drink, came in at $14.73. Ouch. Despite the price, you get what you pay for in quality. Not just with the ingredients, but with the labor as well. I hardly lost even a single bean. Also, by choosing to “Grill My Burrito,” I inadvertently unlocked the secret to confidently wearing white whilst eating something filled with salsa. Bell Street’s guacamole easily topped the charts in Atlanta’s made-to-order burrito market. With just the right amount of lime juice and a freshly mashed avocado taste, this dip added wonderful texture to my burrito. If I haven’t already sold you on the “Grill My Burrito” option, here’s where I convince you. You’ll be rewarded with a lightly fried burrito akin to the Tex-Mex staples I ate growing up in Texas. 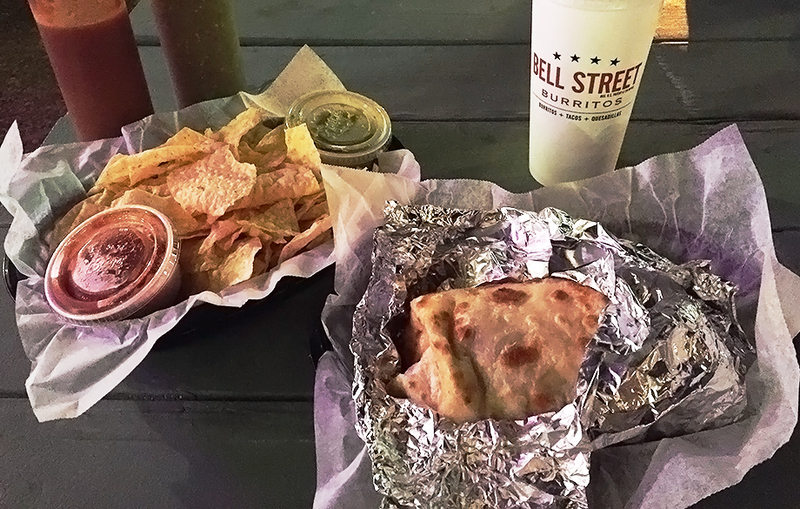 It took Bell Street’s taste out of the fast-food burrito category and into that of a favorite Tex-Mex restaurant in my hometown of Dallas that has been around for nearly a hundred years. Also, grilling the burrito warms up the ingredients and melts the cheese even more. Who would turn that down? What I ordered: White rice, black beans, fajita peppers and onions, chipotle pork, cheese, sour cream, pico de gallo, guacamole, and lettuce. The combo included chips, salsa, and a drink. I was really disappointed with this burrito. One of the core tenets for these burrito chains is fresh ingredients, but instead I found typical fast-food quality, like that of Taco Bell. 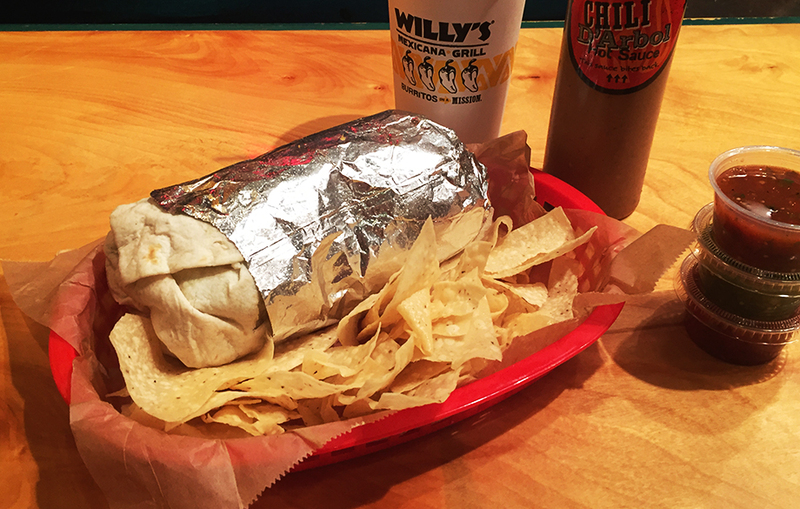 Everything from the black beans to the veggies at Willy’s tasted like they came from a can. Even the rice wasn’t up to par, coming in bland and undercooked. The only saving grace came from the chipotle pork, which was sweet, slightly spicy, and tender. Coming in at $8.90 for a burrito, chips, and drink, Willy’s was the cheapest burrito I ate. But you certainly get what you pay for, and personally, I’d rather pay a buck more for something a little better. I lost more than I’d like out of my burrito, and the sour cream leaked out of the bottom like a flood from a vengeful god. Anytime I have to go wash my hands before I move on to the chips, I’m not the happiest of campers. The guacamole was a little better than the veggies or rice, though still nothing to praise. It was fresh—a welcome change of pace—but only average in flavor. Again, comparisons to more traditional Mexican fast-food locales come to mind. Willy’s offers a selection of some of the tastiest flavors (including an exclusive churro flavor) of Atlanta’s favorite iced treat. Sure, you can find KOP elsewhere (including a small selection at Bell Street), but the convenience is nice. What I ordered: White rice, black beans, fajita peppers and onions, pork, buffalo bacon queso, barbecue sauce, pico de gallo, cheese, sour cream, lettuce, and guacamole. When you combine melted cheese, barbecue sauce, and pork in a burrito, something wonderful happens. The tangy-sweet sauce mixes with the smooth gooeyness of the cheese and emulsifies meat, rice, and veggies in a suspension of yum. It’s highly unorthodox, but incredible. With a middle-of-the-road price of $10.19 for a sizable burrito and a drink, Qdoba is a solid value. 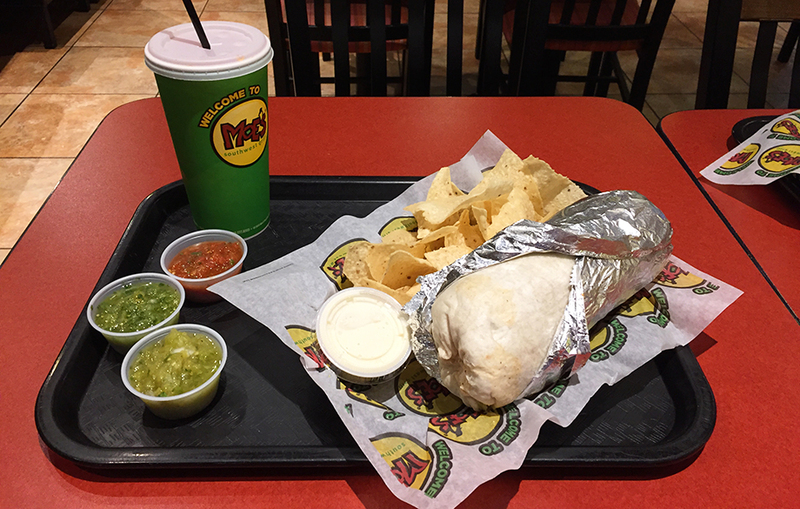 You don’t get chips, but unlike most chains, you get free queso and guacamole on your burrito. Considering my burrito was full of molten cheese, barbecue sauce, guac, and sour cream, I’m amazed it all didn’t end up in the bottom of my basket. I only lost a few morsels of flavor. 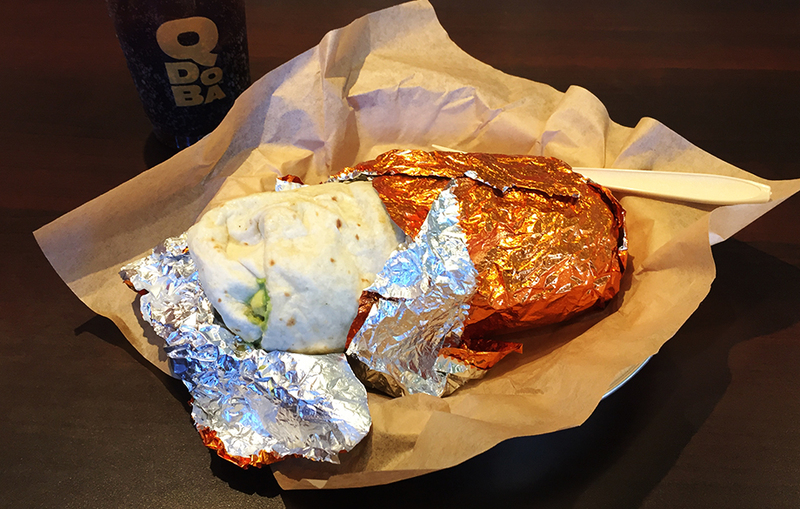 Qdoba also gets extra marks for wrapping their burritos in gold-colored foil. Refreshing and smooth, with just enough lime juice. this is what you expect guacamole to taste like, especially since so many restaurants charge extra for it. Queso by itself is a wonderful treat. The spicy, cheesy goodness has the ability to permeate every nook and cranny of the wrap. And bacon improves everything. Combining the two—with some buffalo sauce for good measure—gives you a dip that sends a burrito’s flavor into overdrive. What I ordered: White rice, black beans, fajita peppers and onions, carnitas (pork), corn salsa, pico de gallo, cheese, sour cream, guacamole, and lettuce. Time is starting to get the better of this burrito mainstay. You’ll still find quality ingredients and fresh vegetables, they’re just not as good as they used to be ten years ago. The pork was slightly salty yet still moist, the fajita vegetables were zesty and not overcooked. It’s a solid choice, but like Moe’s, it just doesn’t have that extra oomph. While Chipotle is the most famous fast-casual burrito chain, it’s certainly not the best value. My burrito and drink rang up at $10.70—high for a meal without chips—but the burritos are large, and you’ll usually receive hefty amounts of fillings. I have an on-going personal beef with Chipotle about how badly their burritos are often rolled. I’ve blacklisted two Atlanta locations already for consistently poor wraps, and a third is testing my patience. Even dining at my most-trusted ITP Chipotle, I still had problems with my order. The spillage filled up about 1/5th of a bowl, and just like Willy’s, the sour cream flowed freely. Chipotle boasts the most “restauraunt-quality” guacamole of the group. That’s both good and bad. It tastes like it was prepared to appease most palates, with safe margins on lime juice, salt, and cilantro, but it’s well-below what I’d dub Abuelita-quality. 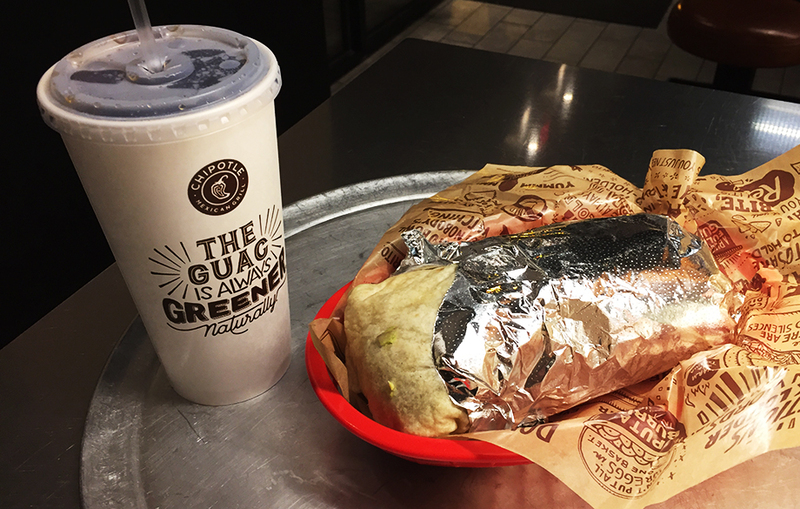 Only one of our burrito joints pours liquor, and Chipotle’s offering is top shelf. The Patrón margarita, made with a tangy, refreshing margarita mix, is worth the $7.00 pricetag. Pro-tip: Add a splash of Sprite from the fountain drink machine for a sparkling treat. What I ordered: White rice, black beans, steak, cheese, sour cream, pico de gallo, spinach, and corn salsa wrapped in a chipotle flour tortilla. The combo included chips, salsa, and a drink. I was blown away with how fresh everything tasted at Barberitos—and I went an hour before closing. I had to order steak rather than pork, which Barberitos doesn’t offer, a meat that isn’t my first choice at a burrito places because it’s often too tough and rubbery. Not so here. It was juicy, an incredible feat for fast food, and actually tasted like, you know, steak. Crisp greens, sweet tomatoes, and spicy corn salsa rounded out the fresh flavor. Even the sour cream, which usually doesn’t vary in taste to me, seemed improved by being stored in bottles rather than tubs. Barberitos is well-priced at $9.78 for the meal, and it tasted wonderful. Even if guacamole had been available, the total cost would be in line with that of Chipotle, but with free chips and salsa. They did charge extra for sour cream, but not for each and every other ingredient. My burrito was very close to rolled perfection. I lost one morsel of steak, which fell onto a waiting bed of tortilla chips. Honestly, it made that one chip taste better. Sadly, due to an avocado farmer strike, no Atlanta-area Barberitos had guacamole during my testing period. Let’s face it, sometimes it’s hard to get behind a burrito’s flour tortilla. It’s not exciting flavor-wise, and it’s not that great for you. 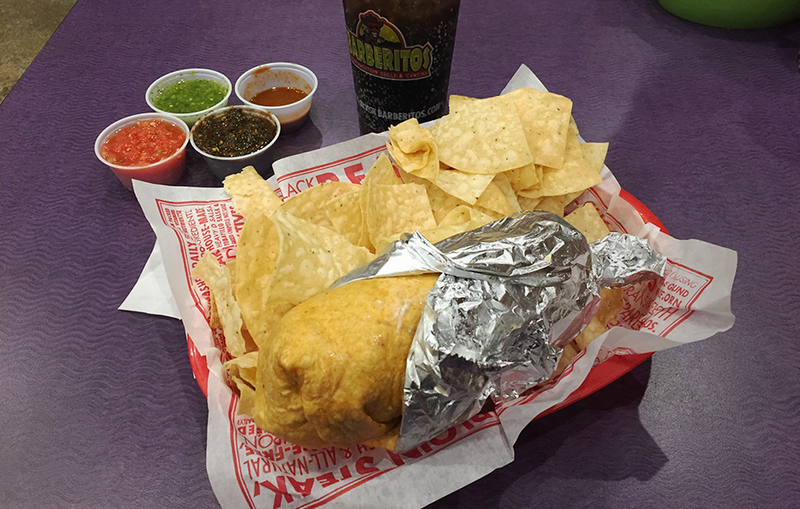 At Barberitos, you can choose between flour, spinach, chipotle, and wheat tortillas. You can opt for a slightly healthier or add some spice to your wrap. It’s bound to keep you from getting tired of the same old thing.